After his daughter was almost choked with a standard electrical outlet protector, George DeCell realized that the standard sized outlet protectors available on the market poses a high risk of suffocation and electrical shock. Determine and motivated DeCell designed SafetyCaps ($2.97 each), the worlds first over-sized electrical wall outlet. 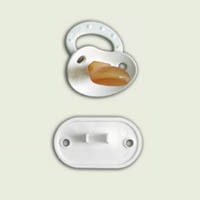 This safety caps unique design was created following pacifier regulations which require at least 1 ¾ inch shield with two air holes in the shield; these holes allow the child to continue breathing even if lodged inside a child's mouth, and aid in the removal without the use of a scalpel. You'll ask yourself, why did not anyone think of this before? I give DeCell my thumbs up! Finally, a training potty that doesn't look like a miniature plastic toilet! 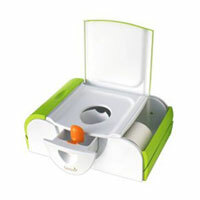 The Potty Bench Training Toilet ($29.99, by Boon, Inc.) features two enclosed side storage spaces (for wipes and other supplies), and a pull-out drawer for easy clean-up, serving as a training toilet, a stool, and a bench. The bench is large and sturdy, it can support up to 300 lbs.